The leading independent specialist for windscreen replacement and windscreen repair based in Tamworth and serving all of the Tamworth area. National Windscreens Tamworth fitting centre provides windscreen replacement and windscreen repair services to businesses and individuals throughout Tamworth and the Tamworth area. 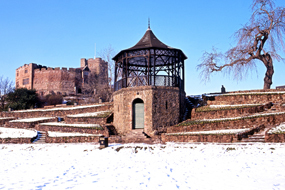 Tamworth is extremely proud and passionate about its history and heritage. The town dates back to the Saxon times which means that it has a rich a full history crammed with stories of intrigue and warfare. It is located 14 miles northeast of Birmingham and 103 miles north west of London. The town is close the major motorways of the M42 and M6 which allow ease of access to the south. Additionally the A5, A453 and A51 allow access to the town itself. The Tamworth windscreen fitting centre and its mobile vehicle glass technicians service the needs of Tamworth and the surrounding area including Burton upon Trent, Lichfield, Alrewas and Wilencote. With 108 fitting centres and over 800 mobile technicians, National Windscreens operates the UK's largest windscreen repair and windscreen replacement network. The company provides low cost, high quality windscreen replacement and windscreen repair from its Tamworth fitting centre 24 hours a day, 7 days a week, 365 days a year. Repair and replacement of all types of vehicle glass including windscreens, rear windows and side windows is undertaken throughout Tamworth and all of the Tamworth area.